Little Office of the Blessed Virgin Mary: Meditations on the Seven Sorrows of our Blessed Lady. The Sixth Sorrow – Our Lady receives The Dead Body of Her Son. Meditations on the Seven Sorrows of our Blessed Lady. The Sixth Sorrow – Our Lady receives The Dead Body of Her Son. O all ye that pass by the way, attend, and see if there be any sorrow like to my sorrow. — Lamentations i. 12. JESUS was dead ; but Mary did not die with Him. Upon her descended an agony which did not kill, and, not dying, yet she was crucified in her sixth great sorrow. Whilst Joseph of Arimathea and Nicodemus were engaged in taking Our Lord's Body down from the Cross, Mary sat at the foot of the Cross in poignant sorrow and grief, reflecting within her all the scenes of her Son's Passion and Death ; thinking of all she had witnessed, all she had heard ; praying to God to support her in her desolation. " Look Thou upon me, and have mercy upon me ; for I am alone and poor" (Psalm xxiv. 16). In utter desolation and anguish of spirit she watched Joseph and Nicodemus release the Body of her Son from the Cross ; and when It was finally lowered to the ground, how tenderly she must have stretched forth her hands, and how piteously, to receive It. Oh ! sad and mournful Virgin-Mother ! Has the world, in its whole record of suffering, any more touching picture to show us than that of Mary on Calvary's blood-stained hill with the mangled Body of her Son in her arms —slain by the world's sins, killed by His own love ! Surely if we are human at all, if we have a grain of pity in our natures, we must give it to this desolate Mother, whose Son we took from her and crucified, whose Heart we broke by our sinfulness, our wantonness and ingratitude. " 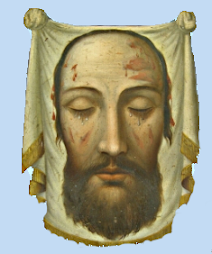 Let my eyes shed down tears day and night, and let them not cease because the Virgin-Daughter of my people is afflicted with a great sorrow" (Jeremias xiv. 17). As Mary had no equal in her love for her Son, so she had no equal in her sorrow. Human effort can never succeed in adequately portraying the sorrow of Mary when she received the lifeless Body of her Son in her arms. We can only marvel at her power, her capacity, for suffering ; at her profound submission and conformity to the Will of God, at her invincible patience and constancy. But God did not consider Mary's sufferings too great since they were endured at the Foot of the Cross, and through them she became a partaker in the Passion of her Divine Son ; but oh ! how her heart was wrung with sorrow on beholding Him in her arms. He went from her in all the beauty of His man hood ; she received Him back a mangled corpse. " My sorrow is above sorrow ; my heart mourneth within me" (Jeremias viii. 18). We can imagine that at first she could not speak ; she could only gaze and gaze at the Body of her Son in an abandonment of love and sorrow. When at last she could speak—when words came to her at all—she murmured in tones of heart-piercing grief : " My Son ! my Son ! " At last Our Blessed Lady could embrace Him, could weep over His Wounds, and by manifestations of affection could show Him her ardent pity and love. And He has great need of love ; for truly the world has not loved Him. Look at what it has done to Him. " Lo ! this is our God " ; and yet, " They have done to Him whatsoever they had a mind " (St. Matthew xvii. 12). His Body is a mass of wounds ; there is not a sound place in Him : " We have thought Him as it were a leper, and as one struck by God and afflicted" ; there are cruel, gaping wounds in His Hands and Feet; the red wound in His side penetrating to the Heart of the world's Redeemer ; His Head is crowned with thorns ; His Body bruised and torn, crushed and mangled from the awful scourging ; He is scarcely recognizable in His afflictions—and this outraged, insulted, dishonoured Body is the Body of the Eternal Son of God, with the Godhead still within It ! " O, my people, what have I done to thee, or in what have I molested thee ? Answer thou Me" (Micheas vi. 3). As Our Lady realized all the terrible sufferings which her Son had endured in His Passion and Death, her soul was well-nigh crushed with pain, and death might well indeed have been a glad release to this agonized Mother. " I am come into the depths of the sea, and a tempest hath overwhelmed me " (Psalm Ixviii. 3). But Mary did not die. She was to teach us how we should bear our sufferings, to draw us to her in our sorrows, to pass through every phase of suffering herself, and then to meet her Son again as the Risen Christ, the Conqueror of Death, the Healer of Pain, the Source of Joy-When we receive Our Blessed Lord in Holy Communion, when He comes to us in His tender love, do we give Him the adoration which Mary poured out over His mangled, bleeding Body ? Does the thought of His Death remind us of our own ? We are always receiving from God—do we ever give Him anything in return ? Do we give Him our whole selves in return for the gift of His Body and Blood ? " He asks so little that He may give so much." Do we mourn over our sins with Him in Holy Communion as Mary mourned over the sins of the world when she saw the havoc wrought in Him by sin, and see our own sins amongst the mass of wounds with which His Sacred Body was bruised and torn ? " What are these wounds that I see in the midst of Thy Hands ? With these I was wounded in the house of them that loved Me" (Zacharias xiii. 6). Do we understand that by His wounds ours are healed, that His sorrow softens ours ; that in the moment of Holy Communion He comes to us with all the merits He acquired by His Sufferings ; do we ever think of all He had to endure before He gave Himself to us in Holy Communion ? Be comforted, be comforted, my people, saith your God. Speak to the heart of Jerusalem and call to her, for her evil is come to an end, her iniquity is forgiven ; she hath received of the hand of the Lord double for all her sins " (Isaias xl.1-2). With what unutterable tenderness and love must Our Lady have removed, as far as she could, all traces of the outrages which her Divine Son had received in His Sacred Passion and Death ; and though her heart was broken at the sight, her courage never failed her for one moment. As she proceeded with this piteous office, the appalling nature of His Sufferings was more and more revealed to her, together with her Son's love for men. How tenderly would she have held those wounded hands and gazed on those arms which had been opened wide on the Cross —those arms which, to-day, are ever ready to open wide again to receive back the outcast and the sinner. We sin, and He draws us back to His Love in tender forgiveness ; we raise up our hand against Him, and He stoops down and gives us His Hand to kiss in token of love and forgiveness. Bring me to Him who sought on earth for me ; Who lived, divinely sorrowful, for me ; Thy Son, the Son of God, who died for me.— REV. FATHER RAWES, O.S.C. The sight of all His sufferings made Mary's heart bleed, and she thought again with compassion of the sinful children of earth whose Mother she had become through the Death of her Son upon the Cross. Jesus Christ gave His Mother to us in His death-agony that she, who had suffered so heavily herself, might help us to bear our sufferings sent to us through God's love. Had any mother ever loved as she, and had anyone ever suffered as she ? " O all ye that pass by the way, attend, and see if there be any sorrow like to my sorrow." " The life of love is a life of sorrow." Did she not know every phase, every aspect of Suffering and Desolation ? Was she not the Mother of the " Man of Sorrow " ? There is not a pain or a sorrow, not a grief or a torment which the human heart is capable of bearing, which Mary has not experienced also. Every one found its way into her heart on that melancholy spring evening when the dead Body of Christ was put into her arms, found their way in and swept in upon her soul till it had no life apart from woe. Oh, Mary, Queen of Martyrs, if you had only been the Mother of radiant Joy and not the Mother of Sorrow, if you had only caressed the sweet Babe of Bethlehem and not embraced the Crucified Christ, could we love and honour you as we do ; could we come to you in our grief's and sorrows with the same confidence and trust as we do now ? You understand Sorrow ; you are one with us in our grief's. And so we beg your prayers, your aid, in our individual sorrows, both spiritual and temporal ; in the cumulative sorrows which press so heavily upon humanity at the present time, in the tragedy of Pain and Suffering which to-day is scourging, cleansing and purifying the world. " This day is a day of wrath, a day of tribulation and distress, a day of calamity and misery, a day of darkness and obscurity " (Sophonias i. 15). And to whom can we better turn in our misery to be comforted, to learn patience and resignation, than to the Divine Victim of Calvary and His Mother, that sad Mother of Sorrow, whose heart, too, was crucified on Calvary ?